Onions and Paper: Challenges for Days Birthday Bash and GIVEAWAY! Are you familiar with Challenges For Days? It is a blog that lists hundreds of craft challenges from around the web, updated regularly with the themes for each challenge. It's a great way of finding new challenges to enter, or keeping track of your favourites. We have a post every day of the week for challenges that are updated regularly on that day, whether weekly, fortnightly or monthly, and a regularly updated post of challenges that are published on fixed dates such as the 1st or 15th of the month. I've been a member of the team there for four years, and currently update the Wednesday challenges once a week. Well, our blog has been helping crafters and challenges to find each other for FIVE years now and we are celebrating by holding a Birthday Bash. There are lots of prizes to be won - take a look at the posts over on Challenges for Days every day from July 22nd to 28th to see who is hosting that day's giveaway - and today it's my turn. To join in today, all you need to do is comment on this post then check back both here and on the main Challenges for Days blog next week to see if you are a winner. And don't forget to check out the other team blogs for the rest of the week - this special post on Challenges For Days will tell you where to look each day - and there's a special bonus because if you comment on the special post you will be in the running for another prize! 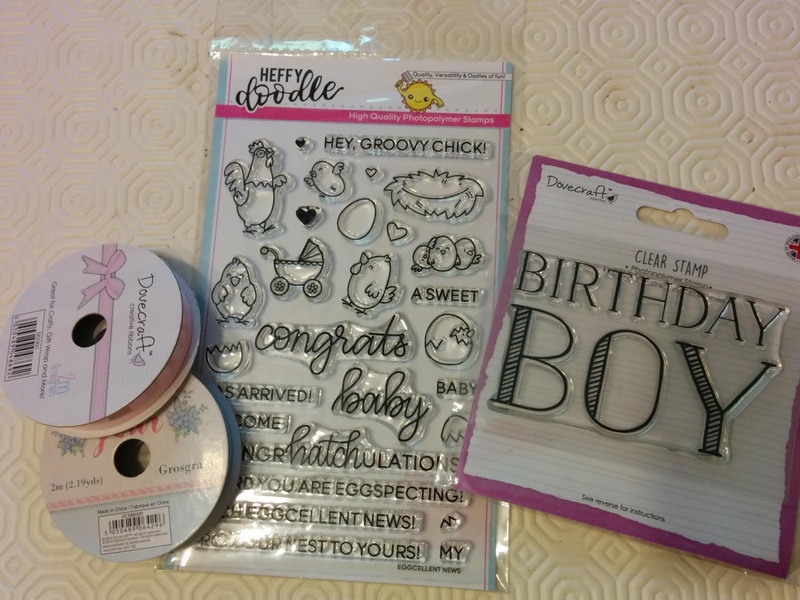 A set of new baby stamps, a "Birthday Boy" stamp, a spool of pink ribbon printed with the words "baby girl" in white and a spool of baby blue ribbon printed with the words "Just for you" in fuchsia. Don't forget to leave a comment on this post if you would like to be in with a chance of winning these goodies. I'll be drawing a winner from all comments made by midnight on Saturday, US Pacific Time - that's 8am on Sunday 29th July here in the UK. Of course it wouldn't be a birthday without birthday cards, so the team have been busy making cards to celebrate the event - here is mine. I have used a selection of stamps, dies and papers from the Heartfelt Creations "Sweet as Honey" collection. The papers are gently distressed at the edges, with the stamped bee-fairy and house coloured in with pencils and glitter for the wings. The honeycomb is die cut from cream card then sponged with several honey-toned shades of ink. Wonderful creation, I love the images you have used.Very bright and cheerful colours. What a clever use of honey comb die and the pretty bee- fairy. Loved the addition of glitter for the wings. Lovely card Jane! Thanks for being such a great team member - I treasure your comments and welcoming spirit! So very glad I came across "Challenges for Days", and I enjoyed visiting your blog and seeing your warm and lovely card. It has such nice texture from the die cuts, inking and layers! Love the layering and textures on your sweet card! Very pretty! Enjoying the Birthday Bash celebration! Sweet and adorable!! Great layering! such a lovely card, I love images and layers. A fabulous card and thank you for the chance of winning this lovely prize to celebrate the CFD 5th birthday. Super make for the CFD blog anniversary - thanks so much for being my CFD "teamie"